The focus for my long distance skateboarding journeys is ‘lightweight’. Compared with loaded unsupported cycle touring, loaded unsupported touring by longboard is certainly more physically demanding. The lighter my gear, the less fatiguing the days will be, and the more energy I will have to enjoy the culture, people, and landscape that I am travelling through. 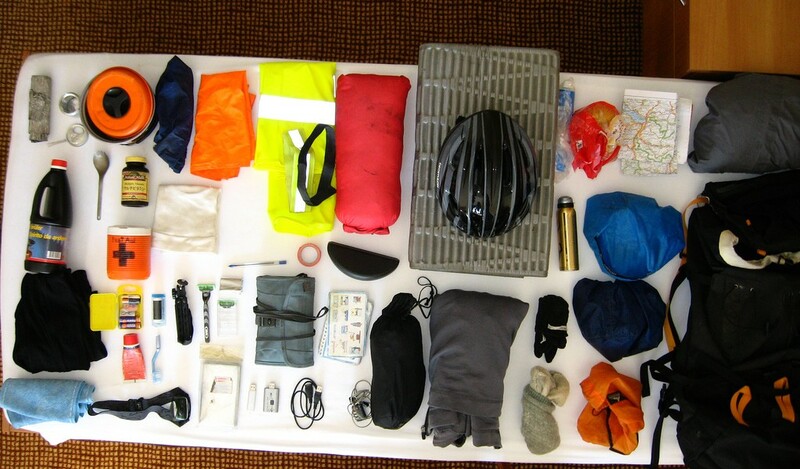 There are still some areas of this list where I could save up to 1,000g (1kg) such as rain gear. Switching to light rain gear could save me up to 700g. Switching to a lighter sleeping bag could save me an additional 200g. That’s equivalent to an extra 1 litre of water I could carry. Numbers like that really come into play when you are travelling in very dry or remote areas. See the boards page for information on what decks I have used in the past. In addition to those items listed above, I typically wear a 200 weight merino wool top, polyester trousers, thin socks, and BBC Icecream Skate shoes. The Icecreams do not give me blisters, so I stick with them religiously. I am now cooking my food on an adaptation from Scott’s Pepsi-can Stove . This great little stove runs on alcohol, and will boil 1 litre of water in about 10 minutes. Hi, Rob. What do you think about using a hammock? Do you have enough comfort with only matress and tent?